Kickerberry lets you manage your festival the way it should be. 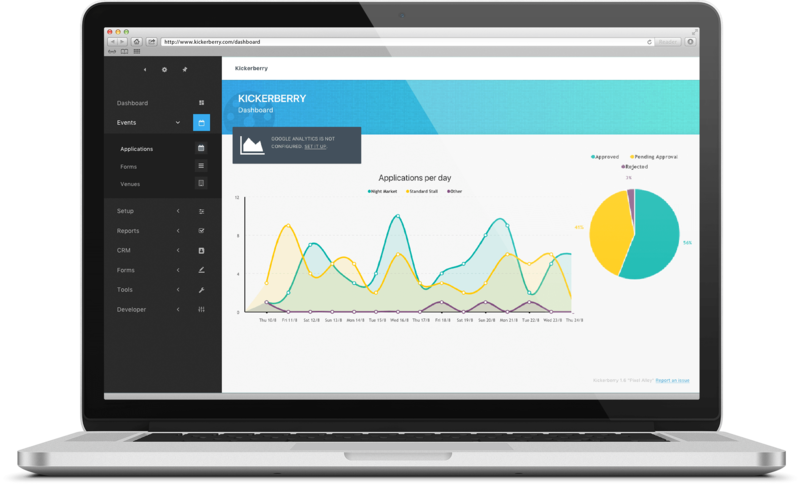 Kickerberry is a dynamic subscription client management program targeted at multiple venue festivals. Kickerberry helps facilitate the growth and management of festivals by reducing administration, allowing events to manage their own IP closely, manage ticket sales & drive revenue through booking fees in a professional, navigation friendly experience. Kickerberry has been custom built over six years by our co-director for a successful grass roots festival, and is now offering this system to new and existing festivals to ease administration and improve work flows across the B2B and B2C customer experience. We understand the capital it takes to build this type of CMS, and have made the system accessible to suit any sized festivals needs and budget. Set your own registrations fees and accept online event registrations & payments from your event hosts. Manage your own ticketing system by setting your own booking fees, ticket amounts, discount codes and group bookings discounts. Put the ownership of supplying event information for event promotion back onto the event hosts with their own unique dashboard and automated reminders for content and payment deadlines. Connect your existing website with the Kickerberry CMS or speak to us about building a new website that compliments your needs. Track which events aren’t selling in real-time to push through your own social channels and general digital content to generate more sales. Track the data you want to track for ease of post event reporting and detailed audience analystics. Communicate with your event hosts through the dashboard to announce key information that can lost through emails. Multiply user access with customer notes section for all parties to keep track of client progress and problem shooting. Put the power in the hands of your event hosts to manage when they turn off their tickets sales and process tickets on the night of the event through our unique event hosts ticketing app. Receive technical, event, sponsorship and marketing support advice from our experienced team.